Whenever I am free, most of my time is spent on YouTube. Just like everybody else, I also go down YouTube’s rabbit hole, playing on any video which might seem interesting. Once in a while, I might find a video which is just too good and is screaming to get shared. Thankfully, YouTube gave us the ability to share videos on the different social media platforms. However, if you don’t want to share the video publicly, but just with some friends of yours, the only option was to share the link of the video through different messaging apps. If you had ever tried to do that, you must know that the whole process was a big mess, both for the sender and the receiver. It seems that YouTube was also aware of this problem, as they have just launched a new share feature which is pretty cool. 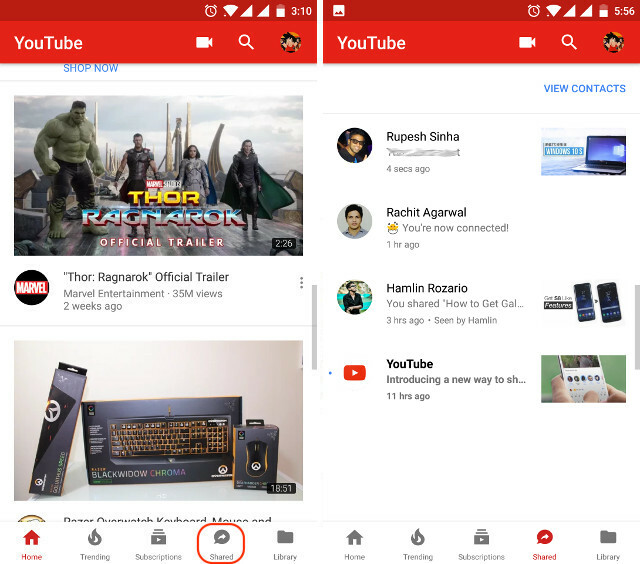 In today’s article, we are going to show you everything there is to know about the YouTube’s share feature and how to use it. 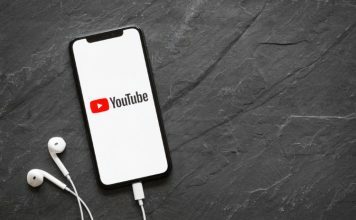 As you could have guessed from the name, YouTube share is a new feature inside the YouTube app, which allows you to share videos with your friends without leaving the app. Apart from sharing the video, you can also chat with your friends, which adds a conversational aspect to the video sharing. You can also share a video with multiple contacts at the same time. The best part is that since the video is shared inside the YouTube app, you can see the thumbnail preview of the video before you play it, so you know what you are getting into. Also, you can play the video from right inside the chat. These features make the video sharing pretty easy and fun. Now, let’s see how to use these features. 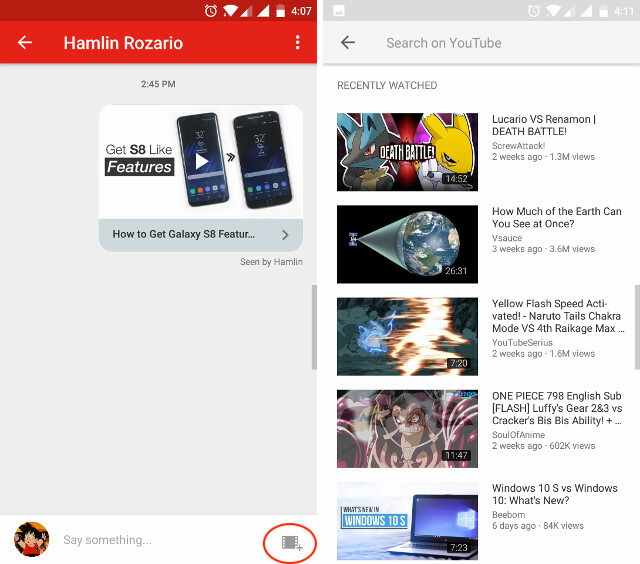 YouTube’s share feature update is rolling out in stages, and you will receive the update in a couple of days. Once you receive the update, a new “Shared” tab will appear in the app. The shared tab will house all the shared videos and chats. But, before you start sharing the video, you will have to add contacts with whom you want to share the video. The tutorial below shows the step by step instructions for adding contacts and sharing videos. 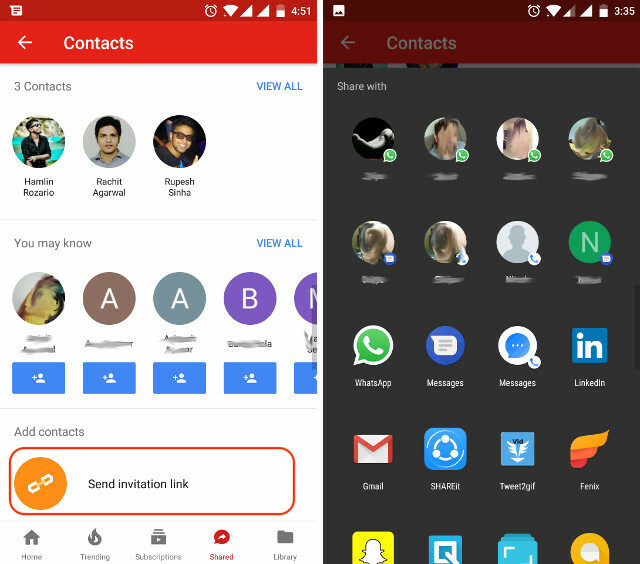 There are three ways you can add contacts in your YouTube app. Also, one thing to remember here is that, once you add a contact, the other party will receive a notification and he/she will have to approve your request. 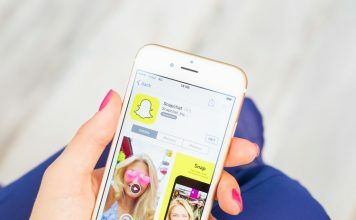 Once the other party approves your connection request, then only you will be able to share videos and messages with each other. 1. 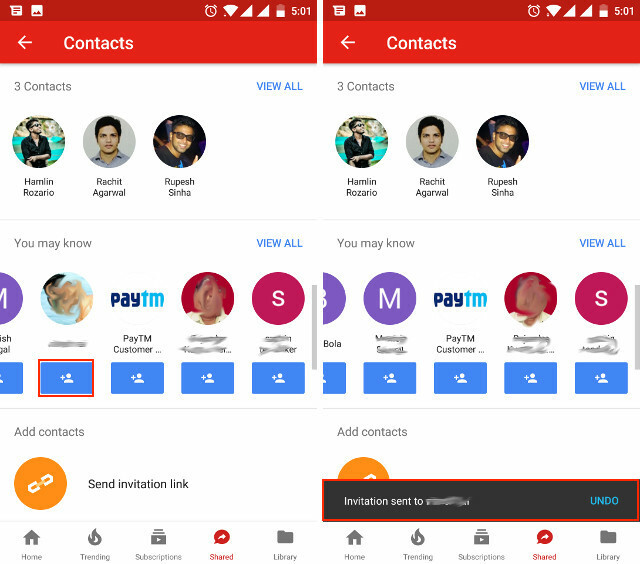 The easiest method to add contacts is by using their Gmail account. 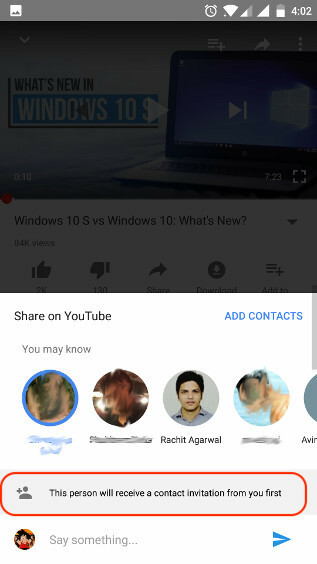 Once you tap on the Shared tab, YouTube will show you the names of the people who are in your Gmail contacts and have linked their YouTube to that account. You can find those contacts under the “You may know” section. To add such contacts all you need to do is to tap on the “add contact” button (marked in the picture). Tapping on the button sends an invitation and the contact will be added as soon as the invitation is accepted. 2. You can also add contacts by sharing the invitation link via different platforms such as social media, messaging, emails and so on. To do that, just tap on the “Send invitation link” button and then choose your medium. 3. 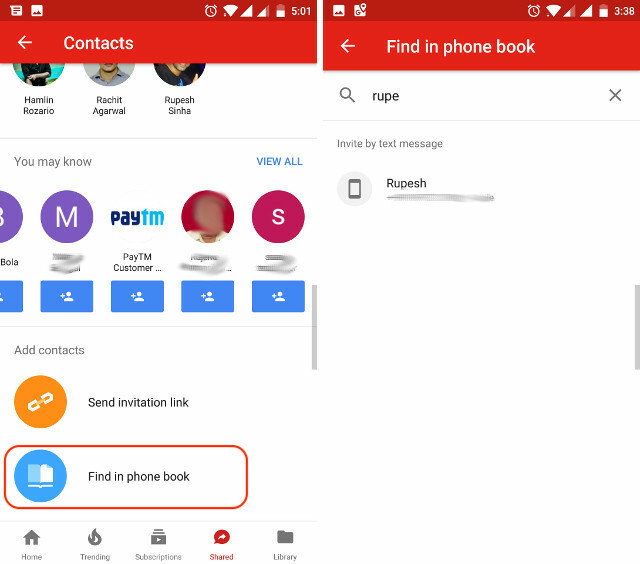 Lastly, you can send invitation links directly to your phone contacts by tapping on “Find in phone book” option. However, remember that for this method to work, you will have to grant “contact access” permission to the YouTube app when the pop up comes. As I mentioned earlier, apart from sharing videos, you can also chat with your friends inside the YouTube app. I don’t think that the chat feature is launched as a competition to other chat apps (Google has its own suit of chat application), rather it’s there just to complement the video sharing feature. With that out of the way, there are two ways to share a video on YouTube. 1. Firstly, you can share the video while you are watching it, by tapping on the share button. 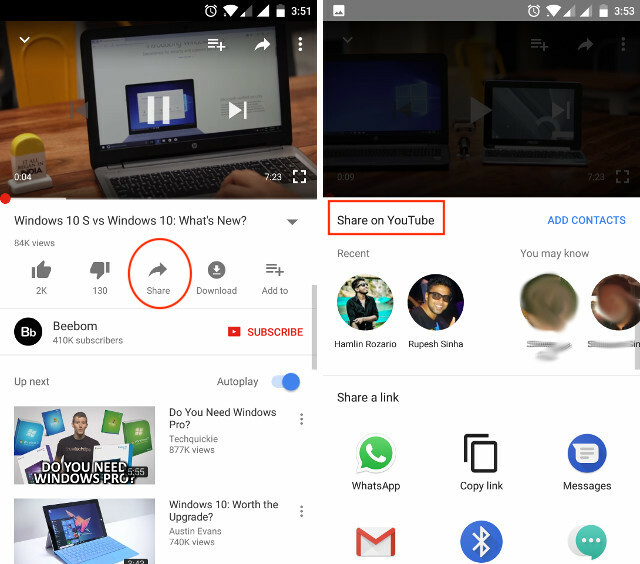 As soon as you tap on the share button, the app will now show you the “Share on YouTube” option along with the usual “Share a link” option. 2. You can tap on the contacts you have already added to share the videos directly with them. As soon as you tap on the contact, a chat box will open. Here you can write what you want to say and then send the message along with the video by hitting the send button. 3. You can also share videos with a person who is yet to receive or accept your contact invitation. To do that, select the contacts under the “You may know” option. Or, you can also use the “ADD CONTACTS” option to do the same. However, the recipient will first receive a connection request. Once he/she accepts the request, then only the video will be delivered. 4. The second way to share a video is to do it from inside the chat itself. Just open any chat ( a chat will be automatically created once someone accepts your connection request and vice versa), and tap on the share button. Here, you will see all of your recently watched videos in chronological order. Tap on any one to share them. Or, you can search any video from the search bar and then share it. 1. 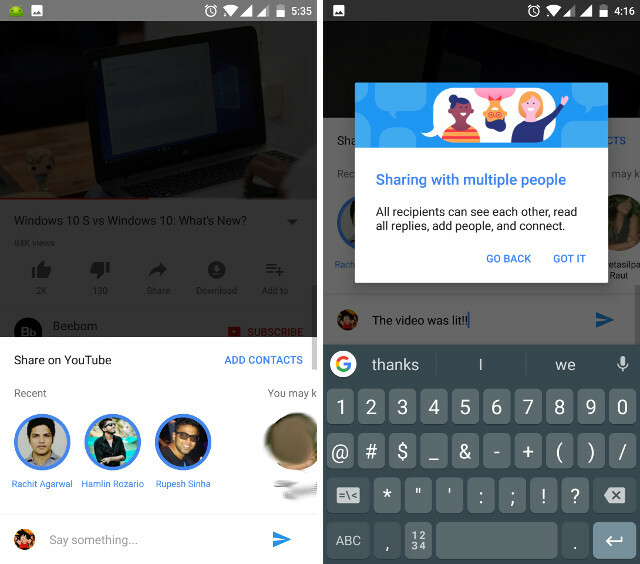 To share a video with multiple contacts at once, first tap on the share button while you are watching a video. Here, select as many contacts as you want to by tapping on them. Now, type your message (or not) and hit the send button. 2. 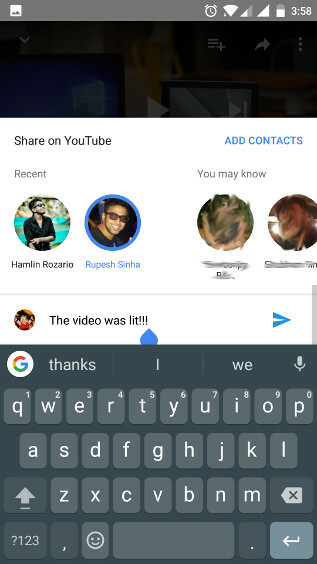 Once you hit the send button, YouTube will create a new group with all those contacts as members. 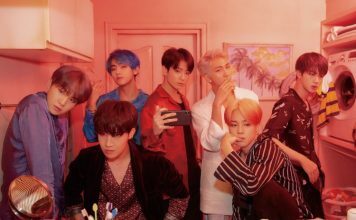 Every member of the group will be able to see the message and the video. 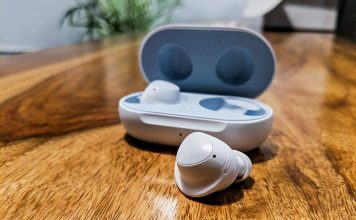 The group will work exactly like group chats on any other messaging apps, meaning everyone can see each other’s messages. The new sharing feature in the YouTube app is receiving a lot of love and hate at the same time. I personally love it. Since the feature is tucked inside a separate tab, it doesn’t affect my normal usage. The restriction of accepting the invitation before anyone can share a video is a very good measure. This ensures that you won’t be bombarded with messages from people, you don’t even know. Thus, YouTube is giving users ample control over its share feature. One can easily ignore it if he/she doesn’t want to use it. But, that’s what I think and your opinion might differ from mine. 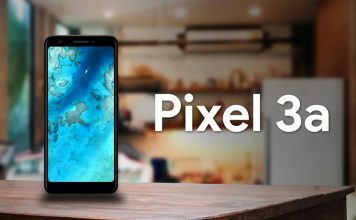 So, check out the feature for yourself and tell us your thoughts on the subject in the comment section below.